I wrote an article about Weed Barrier Fabric and lots and lots of people said; “Hey Mike, if weed control fabric isn’t good, how do we control weeds? So here’s the low down on weeds and how they think. Think about weeds and what they need. They need water, nutrition and sunlight to thrive. Since those are all the same things the plants in our gardens need to thrive, as we tend to our gardens trying to create the perfect home for our plants we are at the same time creating the perfect home for weeds. Water and nutrition are must have things for our garden and even without our intervention there is plenty of nutrition in the soil and water comes naturally. So the only thing left that we can control is the amount of sunlight that we allow the weeds to receive. 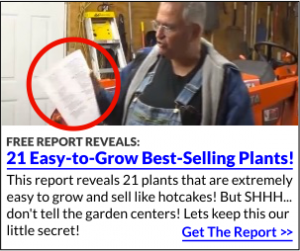 Make Money at Home Growing and Selling Small Plants! Mine have Earned Thousands of Dollars. Bingo! That’s it. We can control the weeds simply by controlling the amount of sunlight that we allow them to receive. That’s great if the bed is to be mulched with some kind of material that will block the sunlight. If for instance you don’t want to mulch your garden, then you have to use other measures to control the weeds. But let’s first consider ways to block the sunlight. Two to three inches of mulch does a pretty good job of blocking sunlight. But the secret to using mulch to control weeds is to get the garden almost 100% weed free before you apply the mulch. That’s a mistake that a lot of people make with their gardens. They never get ahead of the weeds! I am growing thousands of plants in beds and it’s really too much area to mulch so I use pre-emergent herbicides and I’ll explain that in a minute. But even with the pre-emergents I still get weeds. And if I don’t stay on top of it I have a mess on my hands. For the past week or so I have spent my time pulling weeds in these beds. Some of the weeds are 18″ tall or taller. But I want the situation under control so I am going through the beds and the isles and I am pulling all the weeds. In the aisles where I can run a rototiller I will leave a weed if it less than 2″ tall. Even then, I pull most of those too! Anything larger than that I pull because I want the weeds gone. After I pull the larger weeds I go through the bed with my Action Hoe and loosen the soil between the plants and remove any tiny weeds that I might have missed when hand pulling weeds. Once I’m done hoeing (is that a word?) I rototill the isles and when I’m done the weeds are gone. Immediately I apply a really good pre-emergent herbicide that will last for several months. You should see those beds now! They are spotless. I know they won’t stay that way, but what I just did will last a long while. Now, for you at home, you have to do the same thing. Get all of those weeds out of the beds before you do anything else. Then if you are going to mulch, put down newspaper 8 or 9 pages thick then cover it with mulch. The newspaper will blow around easily so lay the newspaper down as you mulch. Don’t worry about the ink on the newspaper, it’s all soy based these days and will not harm your plants. Then if you want to use a pre-emergent herbicide like Preen you can apply it after you mulch. Read the label carefully. They might suggest working it into the soil. I don’t think so, but if that’s the case you can just apply it before you put down the newspaper. 1. Weed the bed until every weed is gone. 2. Lay down newspaper or brown paper grocery bags. Newspaper should be at least 5 pages thick, but 8 or 9 pages thick is better. 3. Put down two to three inches of mulch. 4. Apply a pre-emergent herbicide like Preen. If you do a really good job weeding, put down the newspaper and the mulch, you probably don’t need the pre-emergent herbicide for a while. Pre-emergent herbicides prevent weed seeds from germinating. When applied they create a vapor barrier that nips the tiny weed sprouts as soon as they germinate. If you don’t want to use chemicals that’s fine, you’ll get good results without them if you stay on top of the situation. The Biggest Secret of All! You have to stay on top of the situation. Weeding is not a once a year job. It’s something you do several times a week as you enjoy your gardens. Now when I say several times a week, I don’t mean get out the gloves, the bucket, the knee pad, the dirty jeans and get down and dirty and start pulling weeds. But as you casually stroll through your yard reach down and pull the weeds you see. If you do this, you will not have any weeds in your yard and you won’t have to dedicate a day to pulling weeds for a long, long time. What if the Area is too Big to use Newspaper? If you have a large area that is full of weeds and grass or one of the other and you want it to be a really nice garden you can make the area weed free simply by tilling the soil or turning the soil. All you have to do is till the soil, tilling in all the weeds and grass. Wait about 5 days in warm weather then till again. Just keep repeating this process over a period of several weeks until you see absolutely no sign of weeds. This is what happens. You till the soil and some of the weeds and grass that you tilled in will be near the surface. The hot sun will bake them, drying them out until they are no longer viable. Other weed and grass plants will not be near the surface and will be suffocated being under the soil. When you till again you are once again exposing viable weed and grass plants to the surface and the sun. At the same time you are pulverizing the weeds and grass that are not exposed to the surface. As you are doing this there is a third process that is taking place but going unnoticed. The soil is full of weed seed. Weed seeds often germinate in a matter of days. After your first tilling their are thousands of weed seeds that are trying to germinate. When you do your second tilling you are literally cutting them off at the pass and stopping them in mid germination. Once the seed germinates and is terminated by you through this tilling process, it is no longer viable. Several days later you till again. Thousands more weed seeds are rendered no longer viable. The more times you till the soil them more weed seeds you are eliminating. Of course it would be foolish to think that we could completely eliminate all of the weed seeds from the soil. They blow in by the thousands. So . . . with this in mind think about your veggie garden. You don’t want to use chemicals in your veggie garden, but if you can keep it tilled or cultivated on a regular basis you can keep the weeds at bay that way. Rule #1. Read the labels and wear protective clothing. Yeah, I know. Many people reading this article think that nobody should be using chemicals to control weeds. I love that idea but I’ve pretty much done nothing in my life that wasn’t somehow gardening related and I know the realty of people not using chemicals. We want nice green, weed free lawns so we apply chemicals. We don’t want the Japanese Beetles to eat all of the leaves from our roses so we apply chemicals. The garden stores have a complete isle of gardening chemicals. Therefore as a garden writer I have to address the subject. And I have to admit, already have admitted in this article, that I use chemicals to control weeds. Basically there are two kinds of chemicals for controlling weeds and unwanted grasses. Pre-emergent herbicides I’ve already mentioned in this article and post emergent herbicides. As mentioned, pre-emergents are designed to do one thing and only one thing and that’s to prevent weed seeds from germinating. They have absolutely no control over weeds that are already growing. Post emergent herbicides are designed to kill weeds and unwanted grasses that are already growing. For the most part when you are buying a post emergent herbicide for home use you are buying what is called a non-selective herbicide. Unless you are buying something for your lawn. The weed and feed products that you use on your lawn are “selective” herbicides. In other words they will kill broad leaf weeds like dandelions, but they won’t kill the grass that you are trying to make prettier. But if you accidentally get them on the plants in your flower beds, they will see those plants as broadleaf and could kill those as well. They are designed to not harm anything in the grass family. The most common “non-selective” herbicides contain glyphosate which is a non-selective herbicide that will kill weeds, grasses and other plants that it touches. I use a generic (don’t ask me the name, I don’t remember, I get it at the farm supply store) to spray the weeds on the edges of the nursery. I pretty much use it any place where there are weeds and grasses that I want to completely eliminate and I can spray and not get the herbicide on other plants. For instance, when I get ready to landscape the old house I showed you in the other article I will first mark out the beds with orange spray paint, then spray any and all weeds and grasses inside of the beds before I do anything else. That saves me having to dig them out and it’s 100% effective at eliminating them so they don’t come back and haunt me. Once you spray weeds or grasses with a glyphosate product you have to leave them alone giving the herbicide a chance to work. Glyphosate is sprayed on the foliage of the leaves and grasses that you want to eliminate. More is not better. All you have to do when applying these non-selective herbicides is wet the foliage. If you spray to the point that the product is running off the leaves you are apply too much. Just wet the foliage. Then wait! The way that Glyphosate works is it is absorbed by the plant and the chemical is trans-located through the plant. That’s why when it’s first applied you won’t see any immediately sign of the weeds dying. You have to give the chemical at least 72 hours to do it’s job. After 72 hours the weeds and grasses won’t look dead, but for the most part they are. After 72 hours you can dig and chop, till the weeds in etc. Doesn’t matter, if you’ve applied the product correctly and given it time to work, those weed and grass plants are dead. Does it linger in the soil? People who are very committed to nobody using chemicals will tell you that it does linger in the soil. People like me who use it on a regular basis and have been doing so for many, many years will tell you that it does not linger in the soil. I believe the manufacture claims that it does not linger in the soil but I suggest you research that on your own if you are concerned. All I know is that I can spray a bed or a section of my lawn with glyphosate and three days later sow grass seed or install plants and the plants do fantastic and the grass seed grows just fine. Tips for applying post emergent herbicides. As I mentioned, read the label and take all of the recommended precautions. When you apply it you should have a small one gallon sprayer that is clearly marked with a permanent marker, “for weed spray only”. Never use the same sprayer for any other task around your house. When you spray you have to be really careful to not allow the spray to drift or to get any over-spray on the plants you want to keep. The nozzle on the sprayer is adjustable. You can adjust the spray from a long stream to a very fine mist. The very fine mist is the most likely to drift. So I do two things when I spray a non-selective herbicide. One, I only pump the sprayer just enough to deliver the product. The lower the pressure the less of a mist you will have. It takes pressure to create that fine mist, and I don’t want a fine mist. So I only pump the sprayer just enough so the product comes out the nozzle. The second thing I do is adjust the nozzle so the spray pattern is not a steady stream, but a heavier spray pattern and not a fine mist. The heavier the spray pattern the larger the spray droplets and the lower the chance that they’ll be carried by the wind. Third. Never spray a non-selective herbicide on a windy day. Wait for nice calm day to do your spraying. Now keep in mind, a non selective herbicide will get rid of the weeds that you have today, but it’s a very short lived, step one. Three days after you spray the weeds and grasses that you want to get rid of, you have to employ one of these other strategies to keep that area weed free. Okay, lots of good information here on weed control. I hope you find it useful. 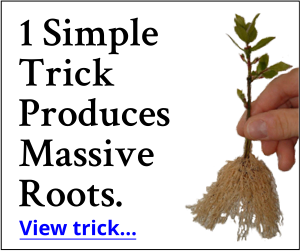 Make Money at Home Growing and Selling Small Plants! Mine have Earned Thousands of Dollars. Once the weeds are dead there is no reason to pull them unless to just make the bed look better. Don’t pull until after 72 hours. Oh my gosh! How do I get rid of devil grass? I usually dig it out, but I am too old now to do that. Please help. Spraying is usually much more effective than digging. Your local garden store will have a spray that works. Or smother it with cardboard and mulch. I have Virgin1a button in my lawn I have tried vinegar with dawn that works fairly well however it kills ithe grass. The weed seems to return. Any suggestions on how to control this? I would not use a barrier for weeds. Instead when the weeds get too thick just use a shovel to dig them up then shack off soil from the roots all using the shovel then throw them away. How often would you have to this this depends on where you live. Here, where we live in Vacaville Ca., the biggest weed problem is Pecan, Oak and Walnut starts even with inches of mulch. In our raised beds these are easy to remove but in the concrete ( I mean clay soil ) it is really a chore. Any way of discouraging the birds and squirrels from leaving the seeds? Also does anyone have a good method ( no chemicals please, the grass can’t read anyway ) for removing Bermuda grass? I have been digging it up but since the drought and the heavy rains this past year I am at my wits end because it is really taking over. If you don’t want to use chemicals you have two options. Constant tilling until it’s gone. Til, let it set for a few hot days, til again and keep repeating the process. If you let it set for more than a few days you will again lose the battle. But even then, once it’s gone you have to mulch or reseed or it will come right back. The other option is to smother it with cardboard then mulch over that. Took your advice and made contact with T&T Mr Maple’s Nursery and found some perfect Maples that were priced right and it turns out they were located only about 10 miles from my home here in western NC.. I did not know they were so close to my home and they must have 10,000 Maple trees !! Every kind you can think of!! That’s fantastic, I’m glad it worked out. Roundup applied properly never gets into the soil. Ok my question on the WEED control issue is, I am getting my daughter a new swing set I want to put something down to control the weeds then either a wood chip or rubber mulch on top. I do NOT want weeds coming up through, there will be no plants so what’s my best way to go??? Honestly? I don’t know that there is a “no weeds, ever!” solution. If it were me I’d use a nice thick, and I do mean thick, layer of mulch. Say 8″ deep. But eventually you have weeds but they should be easy enough to control with the mulch that thick. Weed barrier really won’t help and even rubber mulch will eventually, maybe sooner than you think, get weed seeds growing on whatever is below the rubber mulch. Great post! I really appreciate you sharing those facts on weed chemicals.. I agree with Chris that for something that important, you would think more of us would actually spend the time researching weed chemicals. I have developed and patented a sprayable non woven weed barrier. There is no need to stack, cut around landscape items, or over lap materials. This material can easily be removed by taking away or simply turn over along with the decomposed mulch in to the soil. Then you simply respray another layer of the barrier which is available in several colors. While I am finalizing the commercial stop of the product I am looking for additional environmental requirements that I may need to consider. Is there a location that would list environmental requirements for landscape materials of this nature ? Not that I know of. I’d love to know more about your product. My lawn has turned a little yellow because of the winter. I’m trying to get it looking good again. It’s not even kind of green yet and weeds are popping up. I’m going to try your idea and spray them, I have no issue with chemicals in this area. Our local agricultural extension center in North Central Florida is advising solarizing soil to kill weeds as well as plant diseases and insect pests. I have a friend outside of Pgh.,Pa. Who uses salt dissolved with warm vinegar into a gallon of water, sprays where she wants to kill weeds and grass then plants her vegetable garden every year. Evidently it does not harm her veggies and only does this once a year. I just want to kill the line of grass before I place my 6 bags of mulch down. Plan to use cardboard boxes down for the weed barrier…after I treat for grubs and spray to keep the armadillos away. Sure would like to konw where to buy the sand you said works for rooting..no one in my area of Tampa can tell me. I have TONS of Christmas cactus African violets I’m rooting in water…just so excited now that I’m retired (78) this year and hope I can get an attractive flower garden in my front yard. I also used to use Roundup to kill weeds, before I knew what they were doing to people and the planet. But, having read about Monsanto and the things they do to small farmers, it turned my stomach. And now they are wanting to own patents on seeds so that we won’t be able to grow many different plants. That’s just not okay that these big corps want to control our food supply. I won’t even get into the GMOs and how the studies were fudged to make the gullible public think they are safe. What kind of humans do these things? I just can’t give a cent of my money to companies this wicked. We need to educate ourselves beyond the mentality of having nice lawns. I suppose chemicals are okay if you don’t mind getting cancer down the road or not having any food to eat because the chemicals have killed all the pollinators or given them a disease like the honeybees now are dealing with, I think it was Einstein who said after the bees are gone, mankind will only have a few years left at best. Of course, our lawns will look great as we pull our oxygen tanks on our morning stroll, due to the lung cancer and such. We’ll just let the doctors take care of us though and keep popping those chemicals and drugs, even though we don’t know what they’re all for but, by gum, our lawns, they’re looking great. Oh dear, I didn’t realize that bees need food in early spring from those dandelions I just sprayed. Oops. I get a lot of chickweed, but I don’t mind it because the chickens love. But, my biggest problem is nut grass. Nothing kills it because the nut won’t rot or die. I have solorized my garden and it helped some, but any advice about nut grass and getting rid of it is appreciated. I just bought a one gallon weed spray for the lawn, spectracide, and it says it controls nutsedge. If it were me I wouldn’t be concerned. I don’t think the preem will harm the onions at all. I live in the Central Valley of California. My problem weed is oxalis. This darn stuff has little bulbs, creates new plants from side shoots and also flowers and sends seeds all over. I tried spraying it with full strength glysofate-the kind you mix 1/12 with water, but w/o adding the water. Pretty expensive and a total failure. A few leaves curled a little, but nothing died. I tried covering it with plastic, but the tarp just shredded in the sun and the little devils came back. I am afraid to till it for fear of spreading the bulbs. I am just managing it now by mowing all winter. I mow it to the ground and leave the composted tops lying there. I would try anything to control this evil plant. Suggestions? Do you put the newspaper down around the flowers you have planted? Just wondering how that works. FYI, I put black paper down on my new garden area (no plants have been planted yet) after raking out all the weeds and it is doing a great job. Some weeds here and there, mainly in between the sections, but very controllable. Sure, put the newspaper around the plants, then cover with mulch. I tested out the cardboard and wood chip method in our garden this year. In spring I tilled it I think about 3 times over a period of 3 weeks or so. Then covered everything with cardboard and about 5 inches of chips I picked up for free at the city compost site. The method has been a dream. All the veggies are doing good and I have not needed to water them at all. A few weeds somehow made it through gaps in the cardboard that I somehow overlooked but they are so easy to pull due to the soft moist ground under the chips. Note: If you use wood chips never till them into the soil, only leave them on top. If you till them they will rob your soil of all it’s nitrogen as they decompose. Any suggestion for removing invasive honeysuckle bushes and grapevine? They have been cut back but keep on sprouting. Many are too large to dig up the roots. The honeysuckle is topping 10′ for some bushes and the grapevine is >3″ in diameter. If you can’t dig up those stumps and roots cut them back all the way to the ground and cover with a couple layers of cardboard then pile mulch on top of that. Mike, thank you for all the great information. I’m starting a new small garden in my yard. The area is covered with grass. I used a Glyphosate to kill the grass. All of the grass is dead in the area. Should I dig out the area and replace the dirt with a potting soil mix or, save the dirt I shake off? I’d just spade up the garden and work the dead grass and leaves into the soil. Don’t remove anything. Keep working the soil for a week or so, even two weeks to help eliminate some of the weed seed and active roots that might be in the soil. Work the soil, let it dry, work it again. my garden is stoned and can’t get rid of weeds, use roundup pump ‘n go weed killer but still they come up as fast as ever. Would appreciate your advice. If you truly want good weed control you should apply a pre-emergent herbicide as well as using roundup. Round up will kill what’s showing, but has no effect whatsoever on weed seeds. The pre emergent controls the weed seeds. I’ve never encountered a weed issue that I have not been able to completely control. I can’t thank you enough! I live in NYC and don’t have a great deal of land. However, I enjoy my flower bed running along the front of the house. Last year I purchased a major brand name soil to add to my bed. The result: weeds like I’ve never seen in my life! Within weeks, no matter how much we pulled, they choked and overflowed the 98 petunia seedlings I planted. I was crushed. All winter I intended to get the weed barrier laid down but before I did so, I found your article. Thank God! Was it hard work? Yes! Did I ache for a few days after? Absolutely! But the results six weeks later are phenomenal! We’ve grabbed a few tiny weeds on the way into the house 3 or 4 times but that is it. So grateful! Wish I could post pics but accept my word that my flowers are flourishing! Forgot to say, I used the newspaper then mulch method. Smother the weeds with cardboard and mulch or keep the area cultivated. Either of those methods will work. Where do I find ‘blue rug juniper’? In so cal.? I’d call around to local garden centers and see if it’s a plant that is normally sold in your area. I live in a weed jungle and I simply control them with 2 feet of fresh cut grass. The type of grass that is 6 feet tall. I cut the weeds and grass to ground level and then just pile it up where I want to control the weeds. NOTHING comes through that. No need for newspapers, herbicides or pre-weeding. I’m in Brazil in a tropical environment. Once the grass starts to pack down, it gets really nice to walk on. I used to buy lots of raspberries from an old UVM Extension Master Gardener. He had about a half acre garden in a residential section in one of Vermont’s larger towns. No weeds. None. He wasn’t noted for wrassling with a roto-tiller. His red roto-tiller almost ran itself when he did use it. His secret was to visit the newspaper “drop” a block away and grab all the free, returned papers he needed. I helped him with weed control once, he made it look easy. He partially filled his wheelbarrow with water. Three sheets of newsprint were soaked and dropped where he didn’t want weeds to grow. Each wet bundle was overlapped by the next about 6 inches. Then he covered the papers with 2-3 inches of a sandy soil mix that he blended himself. Not a paper was visible when he was done. By spring, the man-made mulch had all but decomposed into the garden soil. A quick pass with the tiller, and it was time to call Better Homes and Gardens. The key was soaking the papers. Mike, I don’t know if you will see this since it’s been 3 years since you posted it, but I had read someone’s article on weed fabric and they had the same opinion as you, so I chose not to use it. Instead, the yard was weed free and we applied about 6″ of mulch (got 10 cu ft from a tree trimmer and most was good stuff. I am in San Diego, where we don’t get much rain, especially the last few years. The drought tolerant plants are on a drip system, so only the plants get the water unless it rains. I just spent an hour with a post-emergent herbicide on weeds, some 3 feet tall. If they didn’t get any light, and rainfall to date is under 2″ for the 3.5 months in 2015. How come this didn’t work? I’ll promise you this. Had you used the weed barrier cloth you would have had the same amount of weeds and a king size mess trying to clean the area up. There are a number of reasons that you still got weeds. Maybe the area wasn’t weed free before you mulched. I would have applied a post emergent herbicide before I mulched. The other thing is that as the mulch breaks down it turns into awesome compost and weeds will eventually grow in the mulch. For that I use pre emergent herbicdes over the mulch. Weeds are a fact of life, we can’t ever get rid of them, but we can control them and win the game. cal’ i”ll try any thing once iam new to this sort of stuff my problem is wild onions so we”see.. Dig it out by the roots and then be persistent getting rid of any new sprouts that appear. I just joined the group a couple days ago. I haven’t had time yet to read all the posts here so if what I am adding has already been suggested go on by. I noticed a lot of folks wanted to use some type of nonselective chemical to get rid of weeds and grasses in established beds. I use a one gallon sprayer like most of you folks have. I did extend the wand a little so it will reach the ground without having to bend over all the time to get the spray where I want it. Controlling the spray so it doesn’t get on the ‘good’ plants in fairly easy for small areas. All I do is get a 2 liter soda bottle and cut the bottom off right where it gets straight at the base support. I then unscrew the nozzle from the spray wand and stick the small end of the wand down through the neck of the bottle. Push it through far enough to screw the nozzle back on and you are done. When the bottle falls down over the nozzle it will prevent the spray from going anywhere you don’t want it to go. As long as you drag the bottom of the bottle along the surface of the ground no over spray can get out to the surrounding plants. The only thing you have to watch is when you lift the bottle off the ground don’t let the drops that form inside the bottle to drip onto your ‘good’ plants. Very good article Mike. I love your articles and videos. You missed one thing though in weed control–Morning Glory–the bane of our existence here in this part of Utah. Our valley was free of it until someone thought it was beautiful and started it here. Now it is all over the valley and very hard to control. One cannot pull it. It just brakes off and the root is still there. One cannot dig it out as the roots are so extensive and deep. My neighbor was digging a root celler and 8 ft. down the roots were still going. Maybe if we could get the chines to stop watering them we could win. Rototilling only spreads them. Roundup does a poor job on them, but helps a little. Newspaper will not stop them. They just grow under it looking for the smallest crack to come up. I put down cobble stones and filled the cracks with quick lock sand and they still found places to come up. As solid and tight as my lawn is they find ways to come up. All I can do in the lawn is pull them every day knowing it will not stop them only slow them down. Thank you for this article. This has definitely made up my mind about not planting morning glories as much as I love them. I had no idea that they were that invasive. I liked the articles. Thank you for the information. We have a problem with morning glory do you have any suggestions for this? I understand that it has a very long root base and can be dormant for years. So when you open up an area, like we did they come up and take over. We would love any tips you might have. As soon as ground clears from snow, or late Frebruary, depending if you are north of Zone 8 or south, you may put down PRE-EMERGENT, NOT FERTILIZER, unless you want strong weeds, for that is what you are going to fertilize. WEEDS EMERGE PRECEEDING everything else . Fertilizers should be applied in late Fall so they are able to incorporate into the soil during winter. If you need to kill some weeds or grass, buy 1 gallon of white vinegar, add 1’2 cup of salt (sea salt is best) and 1/2 cup of laundry soap. Mix well and apply with a watering can on a sunny day. Repeat in a week to 10 days on anything that is left alive. If you want to plant in the area, wait for 2 weeks and water thoughrouly for 2 days to dilute the acid in th soil, test fpr Ph content and determine if OK fro what you want to plant. If Ph still too high, drench the soil again. Under normal rain conditions, soil is plantable, without additional watering, in 6 months to 1 year. This works great for killing grass/weeds under electric fences and passes all organic soil tests. Mike, down here in Florida, our seasons are reversed. We garden in the winter (vegetables, flowers) and the gardens are dormant in the Summer. I have found that covering the gardens with clear plastic will kill the weeds AND sterilize the soil so no weed seeds germinate. 60 days is all you need. My gardens stay weed free all season and when growing season is over, I cover it with plastic again. Hope this helps. Joe, thanks for the useful tip! What about clover in my lawn? I have a pretty big patch (6 x 8 ft). I don’t want to use chemicals because the patch is right next to my herb garden. How deep are the roots? I am considering digging it out. Any ideas? Dig it out if you like then re-seed, apply straw and make the lawn so strong that it forces the clover out. A gentleman from Ireland who now has a nursery in West Virginia told me to use cardboard instead of newspaper. I’ve been doing this for years now and it works out great. Our local Hardee’s loves to give me their cardboard instead of having to break it down and get rid of it, as our local drug store,. Then I mulch and don’t worry about it for the season, except for an occasional weed. Very interesting… we have a ton of old newspapers… Will use them in the veggie and flower beds this year…THANKS! I don’t get the newspaper anymore so I’ve been using a heavy paper roll (no dyes of any kind) that’s marketed as a biodegradable painter’s drop cloth replacement. The roll is 2′ x 140′ and it costs $7 or $8. I lay down two layers (one perpendicular) the the other and cut an “X” where I’m putting my plant. Then I fold back the 4 triangles created by the cut to plant. Then I nip off the tips of those triangles to create a small square/diamond for the plant base. I usually end up mulching a few inches on of that for good measure. The paper breaks down like newspaper would if not just a little more slowly and is gone into the by the next year. This is good advice I will try the newspaper this time and see how that works. So you are supposed to weed, put newspaper down (8/9 pages) put mulch (at least 3″) and then put your plants in the ground? I have to try this. For a natural way to kill weeds, I hsve used vinegar,salt and a drop of dish soap on spot spaying broad leaf weeds. It dries them out. I have an american elm. Its about 25′ tall . It is not looking too good this spring. I read somewhere gum turpentine csn help . You drill hole and pour into tree. Do you know if this has to be done when dormant? Please Mike never, ever use Glyphosate. 8 inches thick should prevent weeds:) glad I read forward to “pages”. I could just see someone trying to put down phone book thick newspaper in their yard, anyhow…it had me giggling! Hi Mike! I have a puppy and a bare (dirt) back yard. I’ve raked and raked and raked and, of course, there are foxtail seeds everywhere, which won’t be pretty in the spring. What can i do to ensure those seeds don’t flower with a puppy in the back yard? I do have a kennel that i can lock him up in so he doesn’t have access to the yard; but, when i’m home, this won’t work. i can’t picture laying mulch down since i can forsee that will be all over my house. Help!!! p.s. I considered getting artificial turf but at an $8,000 price tag, where i have more time than money, i’m trying to figure out another way. Thanks Mike! the answer is a nice thick lawn that will not allow much anything but the grass to grow. Would be nice if this article had any picture so it can be pinned 🙂 It is a great article and definitely worth sharing!!! Hi Mike, I have just mistakenly scattered weed and feed under ALL my flowers and shrubs. I immediately hosed them down and tried to wash the stuff away and then applied the product I meant to scatter in the first place. What else can else I do? I am frantic. I’m not really sure what to offer. Weed and feed sees most plants as broadleaf and that’s not a good thing. About all you can do is hope for the best. I have dandelions in the rocks surrounding and under fir bushes. Can I spray them if I spray only right where the come through the rocks? How can I spray but be sure not to hurt the bush roots? When you spray, just apply enough product to wet the foliage. If you apply it to the point that it runs off you’re applying too much. Mike: Would you let Mary Theriot know that I replied to her message here about the plants and would appreciate hearing back from her. Kelly, the most budget conscious thing you can do with that backyard is cut down the weeds and start working the soil. If you had a small rototiller that would be great, just till, let it sit for a few days and till again. Before long you’d have the best soil in NYC and you could plant grass or whatever you wanted. We live in Florida and had used a mesh weed mat and then rubber mulch. To say we have been disappointed would be an understatement. My question is do we pull the weed mat and rubber mulch prior to putting down newspaper ? I’d pull as much of the weed mat as you can. The rubber mulch? If you can pick up any amount of it I would just so you don’t keep seeing it for years to come. if we currently have the black weed barrier fabric down, with white landscape rocks on top, is there a product we can use to control the weeds that will permeate the black fabric (the granuals in Preen seem to be too large to get to the soil beneath the black fabric). Your advice is appreciated. Preen only works to control weed seeds, keep them from germinating. For that purpose the Preen should work fine just sprinkled over the stone. As far as weeds that are already there you can use Roundup to take care of those, then apply the Preen. Roundup is applied to the top of the weed not the roots. That’s how it works and that’s how it works best. In stead of using mulch could I still use newspaper while using white rock in my flower beds. Kathy, sure you can put stone over the newspaper, but eventually the newspaper will decompose allowing the stone to mix with the soil. When using stone it’s better to use a weed barrier fabric, even though I really, really dislike the stuff. Thank you for the weeding info ! I have a huge problem under an evergreen. Now, that I have prevented the weeds from growing that are under the tree, they have spread out and are growing around the tree ! How do you control thistle & timothy grass? We feel like we are fighting a losing battle! We have used PREEN and Roundup and have dug them up and still they have come back and multiplied. Help! Mike, I had some blueberry bushes.The rows are 8ft apart,so I made a cardboard circle to put around them and sprayed the walk areas with round-up..well it worked great but there was a leaching affect.guess some root was entwined with the weed roots.It hurt them but they only lost a few outside leaves…also I contacted a lady.stay at home Mom.She has been doing your backyard gardening program for a couple years now.She says she has been having great success.Wife and I are driving up to visit her after the 4th.. Mike there are soooo many scams out here.It is really refreshing to meet a strait shooter like you..Oh and I forgive you for the 9 inches of newspaper. I’ve done the newspaper weed control and it works! A dear friend’s mother told me the secret of a weed free garden. Every day, pull a weed for every year you’ve been alive. It really works. Anyone want more tips on using old pool liners? Can I use the pool liner to kill “grass” in order to put in a rock garden. We live in texas , no water for yards. Good idea but you want to leave some access for moisture if you have plants. Maybe a least around the root diameter so the plant does not starve for moisture. I have an 3 (large)established perennial garden. The problem I am having is with “Wood Violets.” They are taking over the garden and choking out all the other plants. I can’t successfully pull them because if one piece of the root is left then the plant continues to grow. Another problem with them is that they are like a giant vine that grows underground, periodically sprouting up, everywhere. IF I break part of the vine, it branches and creates multiple plants from the break off area. I am to the point,of taking out all of my perennials, and using a chemical herbicide to kill anything that is left, but then I don’t know what to do after the violets are dead. I can’t put anything in the area for at least a year, that hundreds of dead, albeit beautiful perennials. Dig out your perennials the dig the weeds out up. Pour boiling water on whatever weeds and roots you can’t get out. Leave it a day, make sure no weeds are still green. If so boiling water them again. Rake out the dead weeds and roots then plant your perennials back in using newspaper as Mike said. I then like to top it with 2 inches of shredded cedar. For new beds, I’ve had good success with “lumber wrap”. It’s a plastic that most home centers will give away. Put it down and put some rocks on it to hold it in place. A few weeks of very hot weather will usually kill the starting weeds, but also the seeds. Another quick thought is to use a ground cover that grows well in your region. In western PA I use Sweet Woodruff in shady areas as it gets very thick and keeps most everything out of my perenial garderns. I continue to experiment with other ground covers as I hate to spend my hard earned on mulch that is going to rot in a year or two. Living in a rural area, being an exfarmer, I for many years used corn and soybean bags in place of newspapers or cardboard. We are now in a drought. I have been using my rainbird sprinklers to irrigate my rose garden and vegetable garden. Some people claim watering your garden does not work! The trick is to let the sprinkler run 6 to 8 hours! You cannot just go out and walk around with a garden hose for a few minutes! My green garden and colorful rose garden really stand out in the sea of yellow/brown grass. I think if Mike did a rain dance, the drought would be over……. After years of pulling, digging, spraying and cursing, I have found that the best solution for controlling weeds is to plant ground cover! There are many different types for many different looks. That way there is no room for the weeds. I also use white vinegar in a spray bottle on a sunny day for lawn weeds. Thanks for all of your garden talk! I plant about 40 Rutgers tomato plants each year along with other veggies. I have tried several things over the years and I agree; newspapers with mulch on top are the most ideal though I only use 3-4 sheets min. It is initially very time consuming but it pays off in spades in the long run. HINT – To get a decent paper “overlap”: Plant your veggies or flower plants as usual. Tear a 5- 6 inch “slot” in the center of newspaper bundle, short end. Slip the slot around the plant stem & slid the newspaper until the other end butts up against the adjacent plant stem. Then do the same from the other side of the plant. This is also an easy way to accommodate distances between plants for a full covering. For plant spacing less than about 18″ – 24″ you can tear the “slot” in the center of both short ends for two plants at a time. I use straw to mulch but a warning: Be careful where you get your straw bails! Try to procure clean straw bails as they can be full of weed seeds! Having said that; Straw is the easiest mulch to apply, it is plentiful, easy to till in at summer’s end & reasonably priced. The worms & other “critters” not only love the newspaper & they also love the decaying straw. WARNING: For the person that wets the stack of newspapers: If you have leftover stacks of wet newspapers DO NOT leave them bundled tight or under pressure! Believe it or not; the combination of pressure & (initially) wet newspaper can actually cause spontaneous combustion as they dry: FIRE! Talk to your local fire department for safety info. You can buy end rolls from your local newspaper. These are left overs from a printing. How do you get rid of or reduce the amount of locust in a garden? how do I upload a photo,for u to see..
What I really need to know is how to get rid of wild strawberry from the area of my creeping floxx. Doing it by hand is tedious and destructive to the creeping floxx. time know spray with vinegar mix with salt. It kills the weeds and ants on my pathways. Mike, I have found a great and effective way to prevent weeds between plants. I had an above ground pool that leaked and instead of throwing it away I laid it flat, cut the sides off and popped lines on the bottom paice as wide as my rows and laid these down between the rows. WEEDS WILL NOT GROW UNDER OR THROUGH IT. a LOT OF OLD POOL LINERS ARE THROWN AWAY IN LANDFILLS WHERE THEY HAVE A ROUGH TIME RECYCLING OR GETTING RID OF THEM. aLSO THEY HAVE PLANT POTS ETC. ALL PLASTIC AND LOVE TO HAVE YOU COME AND TAKE THEM AWAY FOR FREE!!! I love newspaper and use it a lot! I had a driveway on a slope that an area was washing out from under it. I stacked wet newspaper and covered the newspapers with sod.Yhirty years later later grass still growing and no washout under driveway. I have thousands of daffodils planted by my grandmother beginning before 1910. The weeds LOVE coming up in these beds before the daffodil tops/leaves turn brown. This year I hand weeded (yet again) and once the daffodil tops were brown, I covered the beds in several layers of wet newspaper, topped with 2 inches of shredded hardwood mulch, and then sprinkled Preen. I’ve had almost no weeds for the past 3 months and those that sprouted were easily pulled. The newspaper will have decomposed enough by next spring to allow the bulbs to sprout. I’m surrounded by pastures, so I’ll always have every weed known to mankind, but I don’t think I’ll have the overwhelming problem I’ve had in the past. Each year I plan to add a little more damp newspaper, and a new layer of mulch. I have sandy soil, so the mulch pretty much disappears after a year. You can also use vinegar and boiling water to kill weeds. Absolutely no chemicals in my yard. If you put the preen down then you can’t grow any grass type plants or anything else from seed. No mulch, rock or weed fabric in my yard either. I can’t get in there with the trowel and weed if that stuff is in the way. The best way to keep weeds down is get in there right away and get the root out, get em when they are small and don’t let anything go to seed. Hi Mike, Really enjoy your website. I have a problem with slugs, eating my Primrose leaves and lots of other plants, I haven’t seen them only the destruction they leave behind, how can I get rid of them? Thank you. Every time I mulch the racoons dig up every thing, even my plants. I think they are after the earthworms. There are too many to trap. I have a weed that spreads by stolens and tilling would just make more plants. Glysophate only stunts the growth and it comes right back. Mike, my large strawberry patch got out of control with weeds while I was away. Is there any spray that will work to kill weeds around them? Mike, what is your recommendation for killing wild violets in the lawn? I use empty pizza boxes in the garden paths. They’re just the right width for a path and they don’t blow away. I throw any weeds that I find in the beds right on top of them. By the next spring they’re broken down enough to turn right into the soil. It’s not the prettiest mulch but it’s cheap and extremely functional. What I like about using the newspapers in my flower and vegtable gardens is in the fall, after everything is done producing and I’m ready to tear down the fencing and retire the garden area, I just till in the newspaper. The tiller does a number on it and it becomes a great addition to the soil as a compost afterwards. In spring…I till one more time before planting and the paper that is left breaks down even further. Then plant and do it all over again. The worms love the paper. I tried newspapers and ended up with lots a garter snakes. Can you write an article on how to keep snakes away?? Eeew!! Thanks for all your great info, Mike. I have your books! Donna, I don’t think the newspaper had anything to do with the snakes that I can think of. Garter snakes eat slugs and other “bad-bugs” you don’t want to have anyway, so enjoy their company – they’re helping you! They’re not poisonous, or vicious, so let them enjoy their meals and learn to enjoy their company. I have a colony of northern brown snakes, a close cousin of garter snakes, that den beneath the grass in my back yard during the winter. They’re fascinating to watch when they emerge in spring, mate, then disperse into the hedgerow for the summer. I carefully catch some that linger or head toward my dogs’ pen, and move them toward the hedgerow or other shelter – they’ve never been nasty-tempered at all, and are dry and cool to the touch, not slimy as most people think. Last year (2013), after we had planted everything, I mulched nearly half of our large garden area (all we had planted) with entire folded newspapers, exactly as they came off the bundle, with all the inserts and everything – a whole lot more than 8 or 9 pages! A neighbor of mine delivers newspapers, and had an entire junker car stuffed with bundled newspapers which he wanted to get rid of. I took every last one of them, took off the plastic straps and laid the folded papers overlapping each other by at least an inch or two, like shingles – with the loose edges buried under the next paper, and only the single largest fold exposed. I laid wooden 2×4 boards on the last edge so the wind couldn’t catch the paper and flip it. We had NO trouble with paper blowing, and even though I got tired of pulling weeds first and just laid the papers on top of weeds that were several inches tall, the papers were heavy enough to mash them down, and overlapped enough to shut out the light, so we had almost NO weeding for the rest of the summer. Now that it’s April, those thick layers of paper are still on the garden, smothering the baby weeds that would normally be sprouting everywhere. I’m trying to talk my mother into not having the garden plowed this spring, but laying more paper on top of what’s already there! As one writer said, one of the main advantages of this method is that the soil stays moist under the papers, and we never had to water after I laid the papers between the rows and right up to the plants. My mother has always had to water this garden all summer – it’s mostly clay, so after being soup all during the spring, it dries out to rock-like consistency in the summer heat. Last year, we had enough rain to keep everything nicely moist, it ran down between the papers and soaked in, then couldn’t evaporate back out – any excess was released through the plants’ transpiration process. When I lifted the paper to check the soil, there were worms everywhere – they were always few and far-between during past summers, because the clay was so dry and hard. The papers kept us from walking in mud, and prevented mud splatters on the plants – helping eliminate a lot of cleaning when we got the produce into the kitchen. For some reason, we had very few bugs and very little disease – don’t know if it was the paper, or the local farmers using chemicals on their crops in nearby fields. Whatever, I’ve been saving papers all winter so I can re-paper the garden this year! We’re in the northern Finger Lakes region of upstate New York, so this has been a long winter, just now starting to show some signs of spring. I intend to start a container garden in my back yard, laying folded newspapers right on the grass and placing it right around the baby peach trees in that area. Maybe it will discourage the deer and rabbits from strolling through and munching the trees – I sure hope so! I want to set my containers on the paper – hoping to prevent slugs from crawling up the containers – and build 2×4 frames to hold sets of containers so the wind can’t topple them when the plants start getting tall. I know this is long, but one more suggestion: vinegar. I’ve read that plain old white distilled vinegar can be used as a herbicide, sprayed directly on weeds. It will kill anything, too, so be careful what you spray. I haven’t tried it myself, but lots of people do, so I’m going to try it this year, too. Walmart sells a stronger 6% vinegar in the cleaning-supplies aisle – regular vinegar is only 5% acid – so it should work on the tougher stuff like trumpet vine, poison ivy, orchard/quack/crab/nut grass, etc. Vinegar is nontoxic to animals and humans, which herbicides aren’t, and I’d sure rather use nontoxic stuff than poisons. I also use cardboard. If you read articles on lasagna gardening, you will find cardboard is good. I planted a raised veg. garden on top of the grass by just putting down a good layer of cardboard, then soil. I use it under mulch for perennials and shrubs too. If you have boxes around, recycle them. I also use newspaper if I don’t have boxes. Wanda, yes, I forgot to mention good old cardboard. Thank you! Decided to try the paper / cardboard method of week control. Question: after “papering” and mulching the garden, can I still use a soaker hose to water? Will it get through enough to really water the plants? Mike, how can you put that much newspaper and mulch down when in the spring, with new plants coming up. How do they get thru? If I put it on my stella dora bed, come spring, how will my seasonal flowers come up? We enjoy your website very much. Rita, you really need to put it down during the growing season so you know what you are covering. Hope someone can help me. On the south side of my house is a huge area on the edge of the woods that is hilly and rocky. No way to mow or till it, rocks of every shape and size and tons of weeds, all this beauty right off the rear deck. Takes over an hour for my husband to weed eat the area and due to that it only gets done 3 or 4 times each season. I am overwhelmed it is so hideously ugly! Dalyce, if it were mine I’d spray it all with glysophate, wait 10 days and treat anything I missed again, then I’d plant Blue Rug Juniper about 24″ apart. Then apply a really good pre-emergent herbicide, then stay on top of the weeding until the blue rug filled it. It will take time for the blue rug to fill in, but it would be worth it in the end. I use newpaper almost exclusively on a 1/4 acre vegetable garden. My experience is – don’t spend time weeding before – put that paper on THICK (20 sheets – whole sections! )the first year, and there won’t be any plants alive under it by fall. After that, you can back off the thickness a little, but remember you are blocking the light, so don’t tread too softly. If you do the applications as you plant, it’s really not that much extra work, and, man, do you save work the rest of the year – very little hand weeding. Worms love it, btw – and that’s where I have trouble with chemicals. They have their place, (none to minimal), but anything that kills worms is best avoided. Worms = fertile soil – feed them well! Dave and I agree on the worm-supporting methods. I live in South Florida where the hot tropical sun of the summer is devastating to organic content in the soil. I’ve pulled out nearly all my plants by now, the end of June, and heavily mulched all my beds after having given all of them a dose of kitchen/ yard compost. Many are then covered with “weed-control” cloth (with holes cut for planting whatever). I don’t use the cloth so much for weed control (I’m the weed control) as I do for a layer of mulch underneath the rest. I do not take newspapers any more so I use copious amounts of hay atop the cloth. I consequently have a good crop of earthworms and other living things in my dirt awaiting my October 1 planting. We have the former CEO of Monsanto as a member of our community. Although I am very much opposed to glyphosate, I do admit to using small amounts of Roundup Pro on our poison-ivy and poison-oak, both of which grew 70 foot tall very thick vines up to the tops of the pine trees before eradication. Don’t want those “weeds” ever again. How did you get rid of the Poison Oak, Ivy that was so large? Did you paint on the Roundup Pro? I am very allergic to both – and I can’t get it eradicated! It is also on my trees here in TN – and running along the ground as thick vines. Working in it the first year I retired, I was covered before long. I could use any suggestions. Thanks! Thanks !! !This info was very helpful, i have these weeds that will not leave my flower beds they are green and white star shaped flowers..but they are weeds..i will do the newspaper thing !!! I have those too by the hundreds in my beds!! I pull them daily getting ready for planting season!! I’m going to try the newspaper too….Good luck!! Sorry for the misspelled words and name-I sometimes have fat fingers and hit wrong keys. Ingrid, even if you spray these things you’d still have to dig out the stumps and roots. Hire a big ooff of a guy and let him do all that digging for you. Our WHOLE backyard is WEEDS! Too bad you weren’t here in Canada Mike! Forget to tell: newspaper also help reserve moisture in soil. Also newspaper and leaves dissolve very well in the soil after a long winter and wet spring. 2nd year of newspaper treatment, garden has a lot less weeds coming out. I use newpaper every year. I cover up garden with black plastic painting sheet, throw old carpet, board, or bricks to hold it down. After planting, immediately cover bare ground with 10-12 wet newspagers. I collected whole lot leaves every fall and use it as mulch on top of newspaper. It is a lot work to do this. But after it is done, the whole season is weeding free. Pulling out a couple of weeds here and there is not a big deal at all. Hope this help somebody a little bit? Did you really mean 8 or 9 inches of newspaper? Or should it have said 8 or 9 layers? 8 or 9 inches is a lot! I’m gardening chemical free. I’d rather have weeds than chemicals. Did I say inches? Layers, I meant layers! Got any tips on getting rid of a groundhog that is ravaging my arugula, swiss chard and herbs and is sure to be all over my squash corn and tomatoes? Havahart trap is a mere garden decoration to him. I was thinking Bazooka….good luck groundhogs can be hard to catch..
awww….that’s sweet 🙂 We too feed our groundhog…I love the little guy!!! Try chewing gum the like juicy fruit. They will est it and die because they cannot pass it through their system just put a couple of sticks of unwrapped gum in your yard or garden and cover with a pot or lid. I’ve had huge success with method for gophers and moles. And they never come back to the surface so you don’t have to worry about disposing of them. I have had success with boiling hot peppers, add a little dish soap and spray my plants with the solution. 1/2 inch cpvc or pvc pipe stuck down in the tunnels with about 18 inches above the ground. Then take soda can or any type tin can about the same diameter as a soda can. Set it center on top of the pipe, As the wind blows the can will tap the sides of the pipe, causing a vibration which moles hate. The will leave for good. It worked for me 3 years ago and we are mole free. Hope this helps. This is an interesting approach. Recently I discovered that my lawn is full of Japanese beetle grubs that are ruining the lawn. So far, no moles or skunks digging up my lawn, but I know it’s only a matter of time. In the next few days I will do a post about this as I explore the grub infestation and apply an insecticide to get rid of them. Moles are part of the problem, but the grubs will destroy a nice lawn and skunks will completely destroy the lawn looking for the grubs. Especially in the fall when skunks are trying to fatten up for the winter. Search this site using the terms, moles, skunks and Japanese beetle grubs. I should have this completed around October 1st, 2015.
left over tar paper was used for between rows of my rasberry bushed. I lasted many years an I did not slip out side when it got wet. It really looked rather nice and clean around many of my other rows. It was the roofing tar paper that was 2ft. I think in width. Loved it. Really? Is that safe? I’m not anti-chemical, but that sounds a little risky. Now, for you at home, you have to do the same thing. Get all of those weeds out of the beds before you do anything else. Then if you are going to mulch, put down newspaper 8 or 9 inches thick then cover it with mulch. Mike you are saying 8-9 “inches” thick…I think you mean 8-9 pages thick. Correct me if I’m wrong! I’ve been using newspapers for a long time in my garden all along the edges of my plants and through the walkway between them. Works well, but I have to throw some dirt on papers to keep them down. In fall, the papers get turned into the dirt and are finally used as compost. What about nutgrass? I recently added a flower bed and used top soil to fill in. Now I’m fighting nut grass. Any suggestions for getting rid of that stuff? How about using cardboard? Won’t that last longer and be easier to work with than newspaper? Yes, I forgot to mention cardboard. I’ve used cardboard. I works great, although it is not as easy to shape to the size of a specific bed as newpaper is. The tape on old card board boxes becomes a problem as you find yourself pulling out little scrapes of tape for years to come. One of the boxes I used once hatched out cockroaches. I think the box was from Korea, and the roaches didn’t make it through our winters, but at the time I was very upset to see them running out of my cardboard. Once our plants emerge large enough to work around in the vegetable garden we remove the weeds and place a couple of layers of newspaper and then place straw ontop. The pathways are covered with cardboard. We rarely have to deal with a weed all summer. In our raised bed area we use chunky mulch, mostly cedar in the pathways. The beds are treated the same way as the other garden, newspaper and straw once the plants emerge. Gardening has been so much easier since we started doing this and the garden looks and produces great without the competition of weeds. Like all your INFO. Help. I have Berry Bushes. What is the best product to use to get ride of them for good???? I live in Washing State. Ed, cut them down the spray any new growth with glysophate and just keep spraying until they quit coming back. Or cover with cardboard then a thick layer of mulch. I read once that some have used very thick layers of straw to control the weed population. I experimented with this and it helped but as the straw breaks down it makes a lovely place for things to germinate. I also experiemented with the fibrous mexican fan palms putting just one layer down on the ground with mulch over top and I haven’t had a weed in two years. On a large side area of my home the weeds were insanely out of control so I added the fabric weed block over the palm branches and will wait to see what happens but I am expecting excellent results! I think if you can use something organic it is better but sometimes just to get control extra measures should be taken at least at first to ensure eradication. Periodic maintenance is key for catching new weeds before they get out of control! Lynn, the newspaper or cardboard should work or you can paint on a non selective herbicide with a foam paint brush. Be very careful what you paint. I have Virginia button in my lawn, everything I have tried kills the grass. It seems that the button weed comes back. I have used vinegar and dawn that does a fair job. Any suggestions as to what I can do? If all else fails just get a small bottle of weed control for lawns. That should do the job. You too? After 17 years i am finally giving up on the quack grass and I’m building raised beds throughout the yard. Preen is not the best pre-emergent. It is limited in control. The chemical you need, UNDER the mulch, is Treflan 5G. Totally safe for 90% of your plants, will last for years as long as no soil is exposed through the mulch. Over the top pre-emergent, just spray it over your mature perenials and shrubs, is Surflan AS. A good 3 month controll. Mike is right, get all the weeds out of where you are going to plant, however, pulling is NOT a good way as these beasties will go like crazy from the little bitty roots that tear of. Glyphospahte, round-up, is the ONLY way to go. Roots and all are destroyed. Then plant, apply treflan, and at least 2.5 inches of good mulch. Make sure you keep the area mulched as it will “rot” off in a season and again expose the soil, thus allowing the weeds to go at it again. Soil contains millions of weed seeds just waiting for a chance to make your life a nightmare. Glyphsate, round up, and Treflan 5G, will do wonders to make the area weed free for a long time. Is Treflan 5G a restricted use chemical and do you know if typical L&G centers carry this ? I’m glad you made the correction a few lines later .. I was about to go out to gather all the newspaper by the curb today (its the day we put out papers for the recycle collection). I would need them all to make 8 to 9 inches of cover. Now, for you at home, you have to do the same thing. Get all of those weeds out of the beds before you do anything else. Then if you are going to mulch, put down newspaper 8 or 9 inches thick then cover it with mulch. The newspaper will blow around easily so lay the newspaper down as you mulch. Did I really say 8 or 9 inches thick. You folks have to keep me on track. YES MIKE. IT REALLY GOT MY ATTECION. I WONDER HOW I WAS GOING TO APPLY THAT MUCH NEWSPAPER. GOD JOB MIKE .GOD BLESS YOU. I would like to add a couple of things. I see this happen next door EVERYYEAR! If useing herbicides (selective or non-selective)it is important to do it before the weeds are ready to bloom. As you explained, the herbicide takes a few days to move through the plants during that time many weeds (whose singular function is to multiply) will bloom and set seeds. Not only have you wasted the season and chemicals but also you have exposed the pollinators. When using a nonselective in a planted bed, it can be “painted” on weeds like wild morning glory and kept away from bedding plants. Also cardboard masks can protect plants when spraying nearby. The best weed killer I have ever found is BURNOUT II. It works waaaay better than Roundup. It is organic also! I love it so much that I became a dealer. I would like to know the ratio for Susan’s bleach spray. Also if it kills all plants or just some.Thanks Mike I totally LOVE your website. I use chlorine bleach in a sprayer to kill weeds. After 24 hrs. the weeds are all dead! Thoroughly water before seeding or planting to remove residual salts from the soil and it’s good to go. Sorry, Mike, I had a *fit* when my son sprayed Round-Up on some weeds here. I picked a particularly nasty patch of weeds where I wanted to plant sunflowers and my “test” area was weed free and ready to plant before the Round-up weeds were dead. ==Susan…what are the proportions of bleach-water? Thx in advance…. How strong was your bleach solution. Chlorine bleach kills earthworms! Use it with extreme caution. I have a great suggestion for those who do not wish to use glyphosate “non selective” herbacide. I use a propane driven Weed Dragon that melts the protective outer layer of weeds and grass, killing them. It’s a safe, fast and inexpensive way to rid the garden of weeds without any chemicals. Under using newspaper to control weeds, could you apply the pre-emergent weed control solution before the application of newspaper to kill weed seeds before they sprout? I want to send for your book just don’t have any extra money, after I buy hay for the horses and pet food and gas for my car and maybe is $5.00 left. I love the paper in the gardner I have used for yrs. The first year when we move to the country 12yrs ago I forgot to put the black paper down for the garden and thought I could pull weeds for the summer after about a week the weeds got so tall that I gave up. Question – what can I use to keep the weeds growing in my raspberry patch? I keep pulling them but its a losing war. 3 yrs ago I did use paper it work great. then last 2yrs i got sick and could not weed. now I am tryting win the war again. What type of much to use grass clippings or straw? Mike, how ’bout an article on fire ants and poison ivy? If it weren’t for acres of both, I would have gone organic. Not sure about the poison ivy, but a few teaspoons full of Amdro sprinkled around a fire ant hill will kill it in about two weeks. Our daughter had two acres in LA with at least a dozen hills in her yard before I started applying the Amdro. It took most of the summer to clear the entire yard of fire ants, but it worked great. They have a product specifically for fire ants, but I used their And Block and it worked just fine. I’ve been using food-grade diatomaceous earth (a.k.a. DE) on the ants around our house. Sprinkled some on a large ant-hill in the yard, and within two days they were totally gone. Same with sprinkling around the edges indoors where I saw them – under the bathroom and kitchen sinks, mostly. DE works mechanically, not chemically, by making tiny cuts in the exoskeletons of insects, and drawing out the moisture in things like slugs and snails but it doesn’t harm earthworms! Basically, when an ant walks through the DE, the powder clings to its body. The ant is a fastidious creature, so it cleans itself, licking the powder and ingesting it. The DE begins slicing the insides of the ant, and because it is hydrophilic (loves water), it absorbs the moisture from the ant, drying it out from the inside, and the ant dies. This doesn’t happen immediately, but gives the ant time to return to the colony and shed some DE on its companions. If enough ants do this, especially if the hill itself has been dusted, all the ants get enough DE to kill them. Voila! No chemicals, and no fire ants! DE is a super-fine white powder, much like cornstarch in consistency, made of silica and trace minerals (the fossilized shells of diatoms, a type of aquatic algae). The best DE in the world is mined in the American West (www.permaguard.com), and it’s sold in many feed and farm-supply stores around the country – cheapest in 50 lb sacks. Be sure you get human food-grade white powder, not the stuff mixed with bentonite, and NOT the DE sold for pool filtration systems! That has been heated and converted to pellets, and will not work to kill bugs. You also can’t eat it. Our veterinarian recommended using DE in the dog kennel to control intestinal parasites (worms), because it works the same on them as it does on ants and other insects – while not harming mammals, fish, birds, reptiles or other animals larger than insects. Earthworms seem to be an improvement on other types of worms, because they’re immune to the effects of DE, too. In fact, many worm-farmers use DE in their worm-beds to control other insects that would harm or compete with the worms. Other uses include using it on chickens to control lice and mites – add it to their dust-baths and nest boxes; dusting on cattle, horses, dogs, etc. to control fleas and ticks; dusting on plants (not on flower – it will kill honeybees and other pollinators, too) to kill aphids and other sucking and chewing insects. It is completely non-toxic and harmless to everything except the bugs we don’t want eating our plants. Don’t breathe in the dust, as it will scratch the lining of your lungs, and cause infection. Pam, I don’t know about poison ivy but I do know if you sprinkle dry oatmeal near their nest, (or whatever), they will carry the oatmeal back inside and as it moistens it expands and, wala! ant hill is gone. I’ve use it for a long time and have almost no ant hills left in the yard. put the oatmeal by the ants home. Does oatmeal work for gorphers? My mother used the newspaper, with dirt or pulled weed clods on the corners, for her huge annual veggie gardens for decades. Just 3 layers snugged around each plant once everything was up. One preliminary weeding with hoe. It took a LOT of time, BUT once finally done, that was it for the remainder of the hot Ga. summer. By fall, all was easily plowed under. We left the stacked newspaper in the rain beforehand, to slightly dampen so as to prevent blowing away before weighting corners. No mulch over. Goodness, I would have been a really grouchy teen if we’d added time for that. She canned/froze enough that we only used the groc. for staples like flour. Older cows from their dairy sufficed for meat. I am interested in seeing answer to Mary Hook’s question above about the newspaper dissolving each year and will newspaper keep mums from coming up? I’ve used the newspaper and mulch combo before and it works better than anything else we have tried… my husband thought I was a frugal nut for doing it but most of the expensive products will not work any better and will end up being a ton more work in the long run! Really? Newspaper 8 or 9 inches thick? You must have stock in the local newspaper. Just kidding, 8 or 9 pages is my guess. In the south we have a weed called briers that have roots that go to the center of the earth. you can till for ever and they still come up, through newspaper, maybe not 8-9 inches, but many pages. Herbicides are marginal, roundup will not touch it, brush begon isn’t much better. Any suggestions? Most of the local nurserymen are not much help. Mike, this was a very informative article and enjoyed reading it. I have a real problem with grass between my hostus. We put down fabric and mulch last year, now the grass is coming through and just like you said it is a nightmare. Thank you so much for all your info. I am planning to order your program,just gotta find the right time. Your weed control article says to lay “8-9 inches” of newspaper down. REALLY????? All good information in your articles. Just a few more items. Spraying should be completed before 2pm. In the hot sun, plants are shutting down, not absorbing liquid like they do in the morning. The spray will sit on the leaves overnight and be diluted by the morning dew, reducing the effectiveness of the spray. I sometimes use a handheld piece of cardboard as a barrier to protect plants while spraying. Be careful not to flip it over and rub the good plants with glyphosate soaked cardboard. Another tip is to work backwards so as not walk in the spray and leave footprints on the lawn. If you accidentally get glysophate on your shoes, scuff them on bare soil. The glysophate is readily bound to the soil and this will help “clean” the shoes. Working in close areas presents some challenges with overspray. A foam paintbrush works well as does the “Glove of Death” Google this phrase for an explanation. Your newspaper trick works well, I have been doing this for many years in my vegetable garden. I simply pin the paper with rocks and pick up the rocks at the end of the season. The paper is nearly gone at this point and easily tilled into the soil. many many thanks.a good and very useful article you have posted. DOES THE NEWSPAPER DISSOLVE INTO THE GROUND COMPLETELY EACH YEAR? IF SO THEN EACH SPRING IN THIS ONE PARTICULAR GARDEN – IT GETS NO ANNUALS, ONLY EVERGREENS, MUMS AND ONE JAPANESE MAPLE – AND NOT MUCH ROOM FOR A GARDEN SPADE LET ALONE A TILLER – I WOULD START OVER WITH PREEN, THEN NEWSPAPER, THEN MULCH, THEN PREEN AGAIN. RIGHT? BUT WOULD THE NEWSPAPER KEEP MY MUMS FROM COMING UP OR SHOULD I LEAVE THAT AREA EXPOSED? I cut a hole and put my plants down in it and pull the newspaper close as I can to the plant. Where I news-papered this year, I put in new soil. So, I put the newspaper and then the several inches of new dirt and then my mulch. I also ended up putting in Hosta in the dirt, so the roots will maybe grow down through the newspaper by next year. I have not had to replace newspaper every year. It has taken a couple of years when I placed it around a pond area that I had several years back. Mike, your information is always so complete and useful, but also easy for the average person to understand. I try to convey information in the same way to my customers, so I really was delighted when I found your website by accident about a year ago. Keep up the excellent work! Mary: I would be interested in some of your plants if the price is right and you know for sure what they are and they are not patented. Also, I am in Michigan and need to know that they would survive our winters here. Mary, I also would be interested in some of your plants if the price is right and you can ship to Tennessee. Under your “Using Newspapers To Control Weeds” you mention 8 or 9 inches of newspaper. I believe you meant 8 or 9 pages. The nasty fact is that in Southern California, NOTHING gets rid of weeds. Our climate is a blessing and a curse. Anita, I’m in SoCal & I have HUGE tumble weeds, last 2 years, now new Green ones growing. I wish I could burn them or something, but that’s not going to happen, boiling water is Not the answer, any ideas? Thanks Mike for your response, appreciated it so much. I bought your program several years ago, but was not able to implement it. The time is still not right. I just retired. After we sell our house and move to where we are planning on living I really would like to sell bedding plants as you have outlined. We are looking at places to live with that in mind. Have appreciated your emails and being able to learn about gardening that I have been able to implement now. My lawn has been diagnosed with “BROWN SPOT MOLD/FUNGUIS” not from animals. Do you have any suggestions to treat? Here is some information about brown spot in St Augustine grass. We had this problem in central Texas and the cornmeal treatment cured it! “You can treat brown patch organically -apply cornmeal at the rate of 20 lbs. per 1,000 square feet and dry molasses at the same rate. Cornmeal works better as a preventative so try to apply it in August before brown patch becomes active. 10% Terraclor is a great curative fungicide. I have never seen the term ‘”dry molasses” ? Great article with good information!! Just what I needed to know! Thanks Mike!!! Mike,between the rows in my garden I lay down cardboard boxes, usually two layers thick. Not only does it prevent wees from growing it also makes getting on your knees less dirty and it elininates to till the middles of the rows. Meredith, fresh sawdust, or almost any sawdust will rob the soil of much need nitrogen. It will keep the weeds down, but sawdust needs nitrogren to decompose so it will pull it from the soil, robbing your plants of nitrogen. Mike, Is there ever a time that weeds are actually beneficial? I read the whole article and excellent stuff there…but one thing you didn’t mention (if you did, I missed it…sorry) and I question this, too…but if you spray Weed and Feed, Weed B Gone (anything liquid) if you spray it in weather hotter than I think 80 degrees, it will drift in the air and kill stuff next to where you spray…IS THIS TRUE? Can you use it on a hot, summer day??? and thanks for your input! I believe the labels on Weed-be-gone say you should apply it in the spring and fall when weeds are coming alive. ALWAYS read the manufacturers label on ANY product. It will tell you what the purpose of the product is, how and when to apply it. It is not wise to apply any chemical on a windy day. Ever! Mike or anyone, how do you get rid of out of control Trumpet Vines? Mine is taking over my fence and back yard. We have a trumpet vine that a past owner placed on the property line. It is growing up under our new neighbors car that sits idle, and is coming up in our yard in 36 places all along the side of our lovely home. HELP HELP WHAT CAN WE DO?? Meredith, spray it with a non selective herbicide or just keep digging it out. My weed control of choice for this would be to dig up the root if possible, if not then bring along a kettle of boiling water and pour it sparingly on the plant at it’s base. Be careful whatever it touches will also die, but if it’s something you can always reseed then you are home free, no toxins in your soil just good old water way too hot to allow the plant to survive. I have used this on dandelions too where I can’t get all the root out and it usually works on one application. Check the results next day and see if you need to do it again. the offending weeds will be brown and dead, just take them out or till them in! Yes. 2-4-D is volatile, and on a hot day, it will evaporate from the target plant and move around the garden. There is a less volatile form that is used in warmer climates. Read the directions. Read what the active ingrediants are. Research the active ingredients. “Then if you are going to mulch, put down newspaper 8 or 9 inches thick then cover it with mulch”. did you mean 8 or 9 inches thick or 8 or 9 layers thick? and what kind of mulch will stay on a hillside? I LOVE your articles…but in the beginning of this article you said to use 8 – 9 INCHES of newspaper….we all know that you meant sheets or layers but I thought it was worth replying to just in case someone tried to put down 8″ – 9″…lol…again, LOVE your posts. Glyphosate, which is the active ingredient in Monsanto’s Round Up works by blocking a plant’s ability to take up vital minerals. The toxin works by starving a plant to death. Monsanto has created genetically modified “Round Up Ready plants” that are able to over-ride this disability; however, they will not take up the minerals either. Glyphosate does not degrade in your soil, so when you plant your vegetables in the soil you poisoned, it is sucked into the roots of your plants. If you’re eating them, this means that they will be devoid of minerals they– and you– need to be healthy. If you use compost produced by plants that were subjected to glyphosate or manure produced by chickens, cows, rabbits, or other animals who ate plants grown on land that was poisoned with glyphosate, then your soil will contain glyphosate and your plants will not be able to take up vital nutrients. There is a link between allergies as well as diseases such as Alzheimer’s. I forbid the use of toxins on my 74 acre ranch. I forbid the use of GMO seeds or plants on my land. It is a matter of protecting my little postage stamp of land and making every effort to heal the land so battered and abused by Man. Mike – I’m with you on the newspaper and constant weeding. These methods work. I also abhor weed barrier cloth – ugh! But I don’t use herbicides – don’t want to poison my soil or the local wildlife. 3-Bell Ranch – How do you control your weeds? Help us out here. I’m still looking for a less labor intensive wasy after 61 years of gardening, especially after 61 years because it’s getting harder not easier! I have a 40 acre farm. We grow squash, zucchin, onions, melons, watermelons to sell at our produce stand. Every season I find myself out on my hands and knees pulling weeds. don’t want to use chemicals and I can’t see using newspaper or weed fabric in a field that is 50’x100′. What do you do?? I have had good success in my fruit garden with using used carpet. I basically tile the area between rows. Periotically I remove it to tear off the few things tough enough to grow through it, but there isn’t much. Put it fuzzy side down. Carpet is a win over landscape fabrics in that it doesn’t blow around. For an annual garden like yours, you’d have to take it up completely each fall. You can also use straw. Get a hold of weathered bales. You want bales that have been wet for a year. These will have very little viable seed in them. Place the straw down in ‘books’ to not blow around. Once your squash sprout, tuck the straw around them. This will not eliminate weeds, but it will allow them to be pulled more easily. In the fall either rake up and store for spring, or till in and add some fertilizer to get it to degrade into compost. Sherwood, some folks have had issues with mold using old carpet. I think the guy that I’m thinking of used it in a closed hoop house and had problems because of the mold in the carpet. 3 Bell Ranch- Sure appreciate u sharing those facts on weed chemicals.. For something that important, u would think more of us would actually spend the time researching weed chemicals. But, I’m as guilty as anyone so thanks again. Thank you for posting this. I totally agree with you! Clear the area best you can, lay down cardboard covering the entire area, then mulch over that. The other option is to spray with a non selective herbicide and spray any new starts that come up. Don’t allow them to become established.